In need of something tasty, exotic and colorful? We’ve found your next dining destination for Peruvian cuisine in the Danbury, CT area. With two locations, Empire Of The Incas Restaurant is serving up some of the best Peruvian dishes outside of Lima Peru! We’re not kidding. This place has some of the best ceviche you will ever come across. With a location in Danbury and Bethel, you can expect a good crowd and even better food every time you walk in. Not sure what to order? We highly recommend the ceviche mixto with a little added spice, the papa a la huancaina, the lomo saltado, the chaufa con pollo and any of the other seafood dishes are also a must try. Basically, you can’t really go wrong here. Looking for an exciting night with some drinks and music? Head to the Danbury restaurant! If you’re looking for a casual family style dinner, Bethel has you covered! Great Peruvian food right here in CT. Look no further! Great food and both locations are incredible. Really great food. One of the best seafood places in the area without a doubt. One of my favorite Peruvian places to eat. A bit pricey but portions are very nice and the quality is evident in all of their seafood dishes which I absolutely love. One of the best and probably only one you’ll find in the area. Lots of Latino places but this is the only Peruvian one I’ve come across. Very very good! Really great ceviche and chaufa rice. The lomo was prepared just right and the fish in yellow sauce was incredible. Will absolutely come back again. One of my favorite Latin restaurants in Danbury. Not on Mezon’s level but the food is fabulous. Incredible seafood and rice dishes. Love them! Really impressed with the seafood dishes. I totally agree with the reviews. The lomo on the other hand was tough to chew and not the best representation of the national dish. I’ve had better lomo but the ceviche and pescado macho was outstanding. The reviews are very accurate. I’ve come back many times and have always had a new dish that I loved. If you like onions, spices, cilantro and great flavors then I highly recommend this place. Incredible food. Our waiter recommended we pick any seafood dish when we first visited since we were so new to the menu and I’ll say the same. Any seafood dish you order will be incredible. Best Spanish food in the area for sure. Either location is fine but I agree that parking in Danbury isn’t the best. You won’t find another Peruvian restaurant close by and other Latin restaurants in the area don’t provide the quality you would expect for such a multi-cultural city as Danbury. 4/5, Prices are a little above average but the food is good and authentic. I’m Peruvian and approve lol. My honest review. The lomo wasn’t the best I’ve had and the green aji was too mustardy. As for the ceviche and arroz with mariscos…that was outstanding. I would definitely go back for their seafood dishes. Prices are a bit pricey but the fish and seafood was super fresh and very well prepared. All the appetizers we tried were excellent as well. I agree! The ceviche is the best I’ve had. There aren’t any really good Peruvian places in the area at all. You have some Latin deli’s that have hot food prepared but nothing that specializes in one particular cuisine. Lots of Latin type places with decent food, but Empire is by far the best quality. Always fresh and prepared to your liking. Both locations are excellent. Parking is much better in Bethel. Amazing ceviche! Really love this place! One of the best places to eat Peruvian food in this area. The seafood dishes are very good and although people may gripe about the prices, the food is always good. If you’re looking for a less costly meal in the area you can try this new place in Danbury that opened up called La Kabanita. They serve a mix of Central American and Colombian dishes…very affordable but sometimes you go and they are without items on the menu. I’ve gone 3x now and they didn’t have the 1/2 rotisserie chicken. You get what you pay for! Incas is great, always consistent, fresh and authentic. Definitely a must try if you’re in the area…and Peruvians make the best seafood dishes around! Try the ceviche mixto spicy! Very good food. Can be pricey I also agree but there aren’t too many other places that serve up better seafood dishes in Danbury or Bethel. Very flavorful and always fresh. Service is always good. Both locations are good but the reviews are honest…Bethel is for the family and kids while Danbury is for drinks and a date. Totally different ambiance but the food is the same. Top dishes are the Jalea, Ceviche, Lomo, Papa a la huancaina. Very good and nothing in the area like it in terms of Peruvian. I’ve never been disappointed but the prices are a bit on the high side…the quality is always superb though so you get what you pay for. Absolutely amazing. The best seafood dishes I have had in a very long time. The pescado a lo macho is wonderful. The ceviche is the best you will find anywhere in the Bethel or Danbury area. Try the chicha purple drink that is very common in Peru. It is absolutely delicious and made with purple corn…a must try. Great food and fairly reasonable prices. Some dishes are a bit on the high end but the quality is superb and I’d rather pay more for fresh seafood to be perfectly honest. Both locations are great but parking can be an issue in Danbury. Just a heads up. The Danbury location has more of a bar scene feel while the Bethel restaurant is a bit more refined and for the family in my opinion. 5 stars from me. Probably the best Latin restaurant in the area. We have some good ones but the quality isn’t always up to par. The seafood at empire of the incas is really good. It’s a bit on the pricey side but the portions are good and you know it’s always fresh. The ceviche is popular and any fish or seafood dish is going to be good. I’ve had the beef and chicken dishes but honestly, they do the seafood best in my opinion. That’s their specialty for sure. If you like seafood, this is the place. Really good seafood. The pescado saltado is my personal favorite. 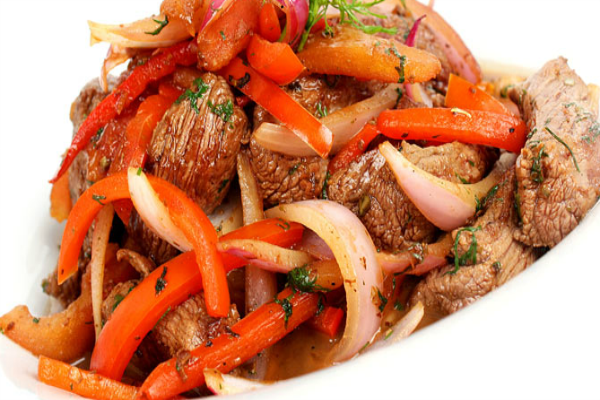 It’s a variation of the famous lomo beef saltado. The papa rellena is also really good. It’s a mashed potato stuffed with spiced meat and crispy on the outside but mashed potato on the inside. Topped with shaved red onions…it’s addictive and kids love it. Very tasty. You can’t go wrong with anything they serve to be perfectly honest. Even the aji dip and bread is amazing and that’s complimentary lol. If you go to either location I recommend the papa a la huancaina as an appetizer along with a ceviche mixto (ask it to be a little spicy). For the main course, if you like beef, I recommend a lomo saltado and if your prefer seafood, any dish is great. The chicha purple corn drink is very good and if you’re new to Peruvian food, I highly recommend these dishes as they are the most popular in my opinion. I agree that the Bethel restaurant is a bit better. Parking is better and the ambiance is different and more family oriented. Both serve the same dishes but the Danbury one brings a different element to be honest. Great ceviches and absolutely delicious seafood. I usually go to the Bethel location since the parking is better than Danbury. Really great seafood dishes and authentic. Only thing I wish is that the green aji wasn’t made with mustard. That’s my only complaint. Some places make it spicy and without mustard…I personally think it’s much better and more authentic without the mustard in it. Other than that, the food is really good. That’s too funny. I’m so picky about that. You can’t put mustard! If you’re ever in NY go to Port Chester and find a little hole in the wall called El Festejo. Ask for a girl named Rosie and let her know Joe sent you. They have the best aji and pollo a la brasa. This place has been my go to for Peruvian. Both locations are good but the Bethel has a more laid back vibe. I recommend the pescado saltado or the ceviche mixed with different seafood. If you like beef then the lomo saltado which is the most popular Peruvian dish would be a good choice. It has pieces of beef sautéed in a Peruvian soy sauce with onions, cilantro, tomatoes and french fries. Best Latin food in Bethel for sure. Service is also excellent and the restaurant is impeccably clean. Highly recommend. One of the best Peruvian restaurant in CT hands down. This place has everything from spectacular ceviches to the very traditional lomo saltado. The first time I went there my wife got the anticuchos “grilled beef hearts.” I wasn’t so convinced about it, but when I tasted it, it was really tasty and tender. For my entree I got the Pescado a lo Macho (sea bass topped with a Peruvian creamy sauce with all kinds of shell fish). Pescado a lo macho was one of the best dishes I’ve had in a long time. The staff is amazing, they make you feel like you’re right at home. If you are looking for something different and amazing go to empire of the incas in bethel, trust me you won’t regret it. This is the place I will be visiting when I come back to CT, Amazinggggggg fooooooood!!! !